QMotion Advanced Shading Systems were invented and developed in the USA. The unique technology used is predominantly taken from the garage door industry where small motors and some very special springs have enabled engineers to develop very large window treatments that can be operated effortlessly by the user. When Qmotion Inc.'s Inventor, Willis Mullet, took this technology to window treatments it became a game changer for shade motorisation industry. We are now the industry leaders for wireless motorisation by which no other system is able to match in terms of its operation functionality, battery life or indeed original design. QMotion have taken wireless motorised solar shading to new boundaries and continue to develop the same technology with breath taking speed in which they are able to bring new and innovative product to the market. With many more products in the pipe line you can be rest assured that QMotion UK are extremely well placed to meet all your immediate and future needs for the most technologically advanced wireless shading solutions available today throughout the world. Qmotion is battery powered and can be remote controlled, so there are no wires to install or complicated building works. For the first time there really is a system by which you can use motorised shades without the need for chasing out walls or installing unsightly surface mounted conduits to hide the wiring. Got a smart phone, or tablet? You can control your blinds using the QMotion app. QMotion UK can offer an app for both smart phone and or tablet which can be downloaded in either IOS or android formats. For the app to work and recognise the fact that QMotion UK shades have been installed, the user needs to install a Qsync into their Wi-Fi router. Once the QMotion app of choice is downloaded all the shades can then be addressed individually and if required grouped together, therefore providing an excellent and easy to use platform in which the shades can be operated. Based on four operations per day, the batteries last 5 years, and are a breeze to replace. QMotion Shades come complete with pre installed readily available standard Alkaline D cell batteries. The battery life is dependant on the size of the shade and the amount of operations carried out on a daily basis. However based on a standard sized shade and alongside our fully vetted testing procedures we would suggest that it will work for up to 5 years with out the need for replacing batteries based on 4 fully up/down operations per day. The cool QMotion multi-function remote control allows you to control one or multiple blinds at once. 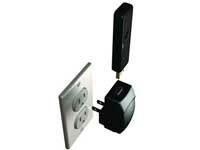 QMotion UK Remote Controls are offered in standard white finish and are designed for easy set up and operation. We offer two types that can either operate a single shade or if more than one shade is installed a multi control remote can be used. Other remote control accessories that can be purchased are easy install flush mounted plates, which can be fixed to your walls and will hold the remote you have selected by magnet to the flush mounted plate.